My daughter loves sushi. Seriously, if we went to sushi as much as she would like, I would need a third job just to pay for her raw fish bills. She will try all of it if we let her. The last time we went out to one of those sushi boat places, where all the food floats by, she was in fish heaven. Do you think she'd be happy with a kid's meal? Heck no! She wanted everything that the adults were eating. She left with her plate and my wallet empty. It's a blessing and a curse to have a daughter who will try almost anything. Because of her pescatarian love, I thought it would be fun to make her something different for lunch today. I obviously wasn't going to spend the time or money to make her an actual sushi lunch. Can you imagine what the seafood would look and taste like at lunch time? I don't even want to think about it. 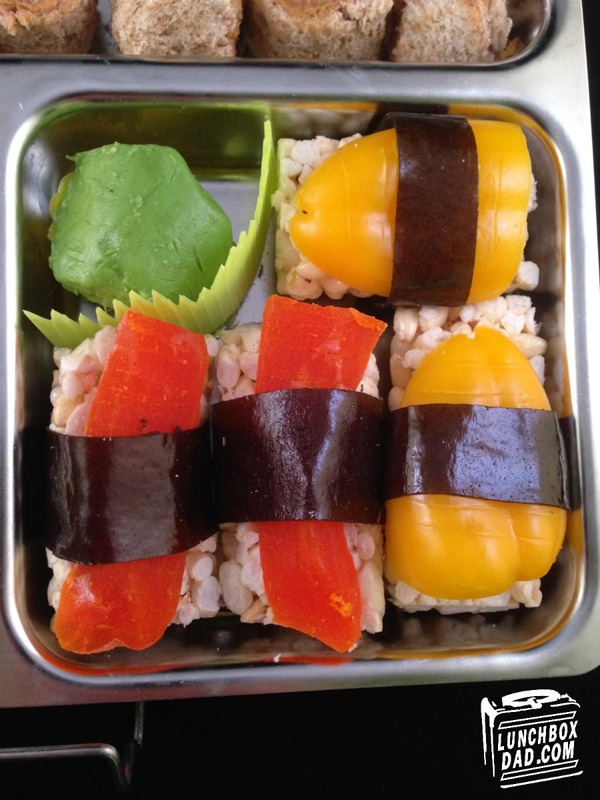 So here is my Faux Sushi Bento Lunch. 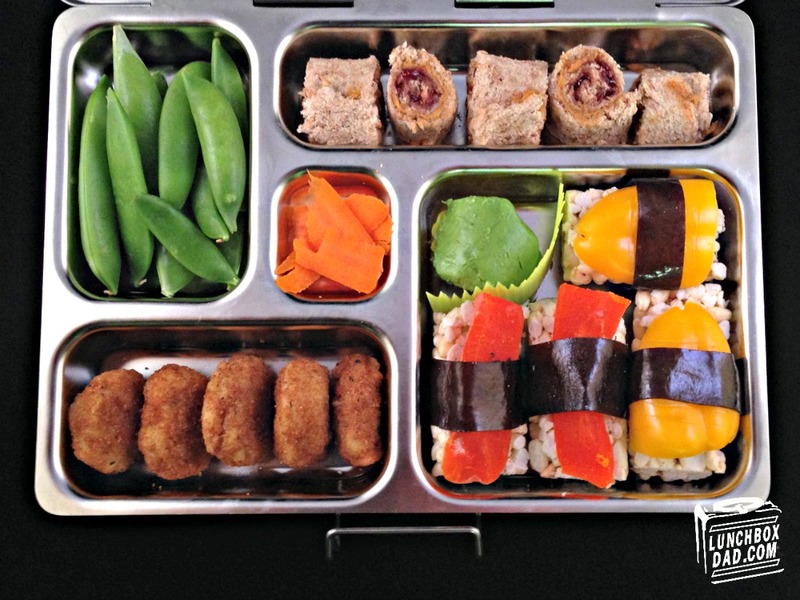 Everything is made to be a replica of a sushi meal but much more school and wallet friendly. I made the lunch in a Planetbox lunch container and also threw in a Lunchbox Love note. 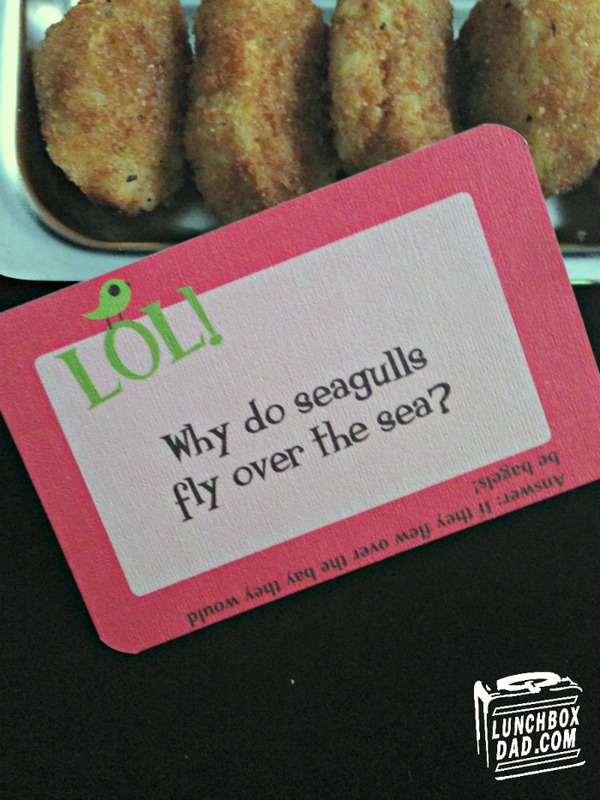 They make awesome riddles and jokes to put in your kids' lunches. Also, please remember to follow me on all my social media channels. The buttons are on the upper right hand side. I received some of my inspiration for this lunch from my genius friends over at Chaos and Confections, One Crafty Thing, and Zoe's Lunchbox. 1. 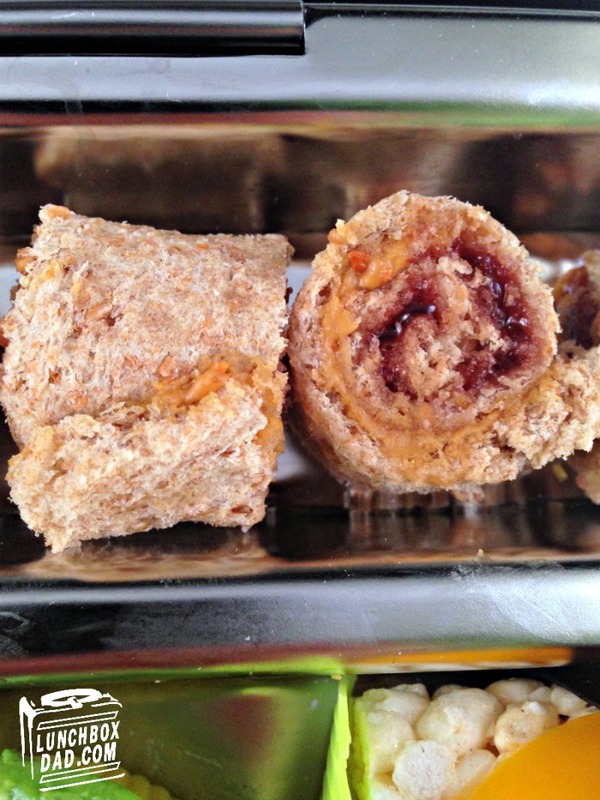 To make the PB&J sushi rolls I used Dave's Killer Bread. They sent me a few organic loaves to try out and I have to say I am very impressed! You can see detailed instructions for this part in a previous lunch I made HERE. 2. In the side dishes I used snap peas for edamame and all natural chicken nuggets for tempura. These are from Earth's Best, use no antibiotics, have whole grain breading, and 70% less fat than the leading brand. 3. For the ginger and wasabi I substituted carrot shavings and avocado. They seemed like a natural fit. 4. The nigiri pieces look hard but were very easy. I sliced rice cracker rolls in half. I then cut dried papaya spears and yellow sweet pepper and placed them on top. The finishing touch was to use a few small strips of fruit roll (fruit roll up, fruit leather, etc.) and wrap them around each piece to substitute for seaweed. Try and find the healthiest fruit roll you can, but no matter what it will be the treat for dessert. 5. Also organize everything nicely. 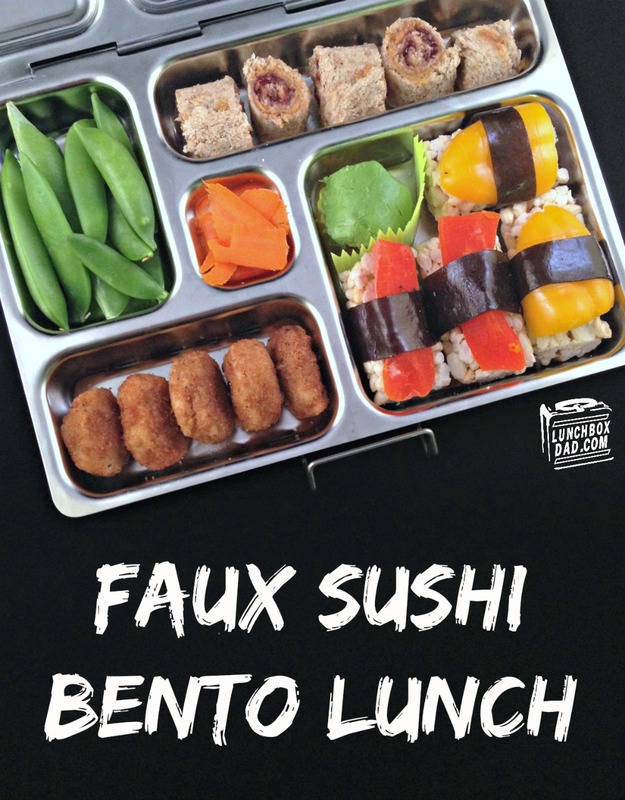 An authentic sushi bento box is as awesome to look at as it is to eat! Disclosure: Dave's Killer Bread sent me their product to try out. I received no other compensation and the opinions expressed are my own. It turned out amazing! Love that your daughter loves sushi! I bet she was thrilled with this! Thanks Sarah, she loved it! Hey, I'm sorry, I never post comments but one thing did annoy me - sushi is not raw fish! You can make sushi with anything, veg, cooked meats, even fruit. Sushi is just vinegared rice with other ingredients. Anyway...other than stumble on a pet hate of mine, I love all the lunches you make! What are rice cracker rolls? And, where do I buy them? Thanks for the heads up. We usually think of sushi in our family as raw fish. I appreciate you clearing this up. Rice cracker rolls look like little logs and we found ours at Costco. Not sure where else they are available.